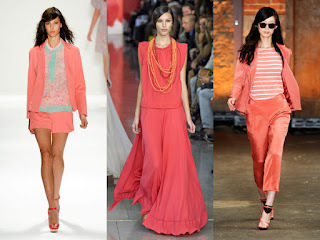 Since we are a season behind the northern hemisphere in terms of seasons, it’s therefore probably apt that the spring 2012 Coral runway trend is hitting us now. This colour is fun and bright, it is hue is feminine with a bit more edge than the traditional pink. Personally I am mad about this colour; it has been in my closet for a few seasons in varying shades. It suits a lot of skin tones and is even showing up in home décor! The reason I love it is because it is a happy colour; it brings to mind hot summer days and nights and all that is associated with warmth. I paired it with cream and my heels for a formal business look with my pop of colour. I'm loving the colour trends of this season, there are colours to suit all tastes. Brights & Bolds, Neons, Pastels...even prints.